My aunt is a little obsessed with QVC, and when I say a little, I mean a lot. Anyway, last Christmas, QVC featured the Clarisonic Skin Cleansing System, and my aunt purchased it for my cousin. My cousin swears by this little device, so when it was a special value on QVC again last weekend, she was on the horn with me and my mom convincing us this was the #1 item. Since my mom and I were vulnerable after putting together IKEA furniture all day and finally relaxing to enjoy a glass of wine, we caved and purchased this little “miracle machine”. After using it only a handful of times, I am sold! This is seriously the best and only way I will ever clean my skin. I am amazed at how soft my skin is and how clean it feels. Here is the official description, but honestly, you have to have it. 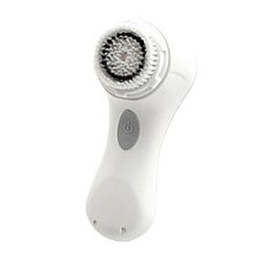 The sonic frequency moves Clarisonic’s soft, gentle brush back and forth at more than 300 times per second, thoroughly clearing pores and skin surface.Here are some of the benefits this revolutionary skincare tool delivers:- Removes makeup six times better than traditional methods.- Clears pores and reduces the appearance of pore size.- Cleanses so thoroughly that skincare products absorb better.- Creates noticeably healthier looking skin.